While the “ENGINE START STOP” switch is in IGNITION ON mode, depress the brake pedal and move the shift lever. 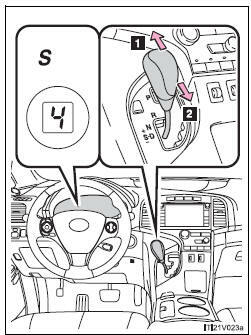 While the engine switch is in the “ON” position, depress the brake pedal and move the shift lever. Shift the shift lever to the S mode driving position and operate the shift lever. The initial shift range in S mode is set automatically to 5 or 4 according to vehicle speed. 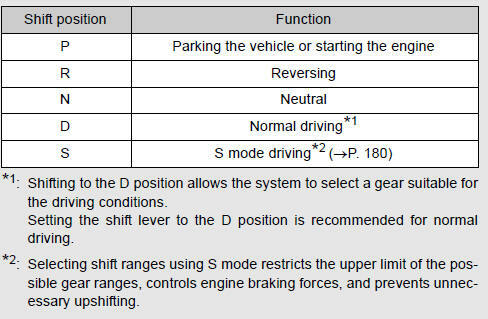 However, the initial shift range may be set to 3 if AI-SHIFT has operated while the shift lever was in the D position. • Automatically selecting gears between 1 and 6 according to vehicle speed and driving condition. (However the gear is limited according to selected shift range.) • You can choose from 6 levels of engine braking force. • A lower shift range will provide greater engine braking force than a higher shift range, and the engine speed will also increase. • When the shift range is 5 or lower, holding the shift lever toward “+” sets the shift range to 6. • To prevent excessive engine speed, a function was adopted that automatically selects a higher shift range before engine speed becomes too high. • To protect the automatic transmission, a function is adopted that automatically selects a higher shift range when the fluid temperature is high. 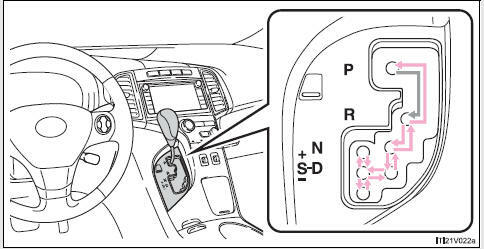 Even when performing the following actions with the intent of enabling engine braking, engine braking will not activate while driving in S mode and downshifting to 5 or 4 because cruise control will not be canceled. This may indicate a malfunction in the automatic transmission system. Have the vehicle inspected by your Toyota dealer immediately.